It was a harsh comment, but at least it was anticipated. I asked for it because I took a picture of some unnamed cousins in SS uniforms to school for history class. While I never did find out their names, they still remain in my family tree somewhere, along with other relatives that fought against and were held prisoner by the Nazis. It would have been easier to take in the pictures of the GI's that were closer relations, but their history wasn't in danger of being lost, unlike the nameless cousins. I'm not proud of what the Nazis in my family tree did, but I am proud to know that I share a bloodline with them – I carry a perpetual reminder about a part of history no one wants to repeat in my veins and on my face. People with Confederate ancestors can understand that, and a couple students from North Carolina have learned that lesson the hard way. Ronald Creatore had to talk to the press to defend his daughter for posting photographs of herself on Instagram waving a North Carolina regimental flag, primarily because it was mistaken for a Confederate one and was captioned with the phrase “South will rise.” That phrase is associated with Pickett's charge, and the photos were of the girl and her friend engaging in a reenactment of that phase of the battle in Gettysburg, Pa. Unfortunately, because teens were involved, the situation quickly devolved into a battle over slavery, since at least one comment on the pictures referred to acquiring slaves. Reports indicated that there were highly emotional reactions to the comments the photos generated, and it appears that the school district may need to remind students that they need to refrain from making racist comments anywhere including Instagram. As the teens have been sharing some heated remarks, cooler heads have not necessarily prevailed among the adults, either. The North Carolina NAACP quickly stepped in to object to the racist comments on the photos, which is absolutely right. 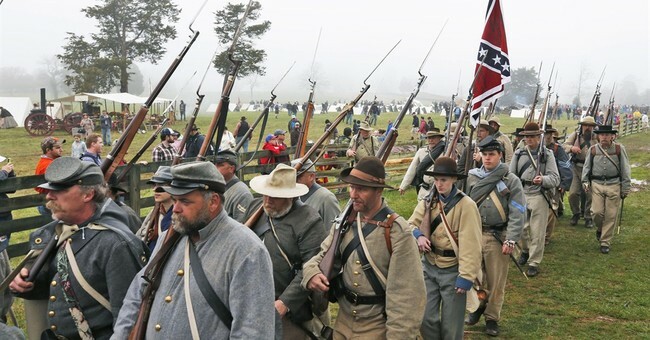 Objecting to the concept of considering Confederate soldiers heroes, which is what Creatore's daughter posted in her apology for the confusion over the regimental flags, might have been a bit too far. Perhaps the girl also should have pointed out that in Gettysburg, all war dead are considered heroes – Union and Confederate. President Abraham Lincoln himself declared that when he dedicated the national cemetery there, and delivered the Gettysburg Address. Since the battle in 1863, Gettysburg has repeatedly been the symbol of and site for the reunification of this nation, first through soldier reunions, then through the Eternal Light Peace memorial that President Franklin D. Roosevelt dedicated in 1938. Some Pennsylvanians will say that the Commonwealth is the birthplace, and re-birthplace of this nation because of Philadelphia and Gettysburg. Creatore's daughter just wasn't very good at expressing the history lesson she definitely was receiving from either the National Park guides or a paid tour company. The NAACP representatives are definitely right about stamping out the true racism that showed up in the comments on the photographs, but those flags are a reminder that shouldn't be buried in the mists of time. Erasing or re-writing history is a dangerous business, and avoiding pain or discomfort is not a valid reason to do it. Milan Kundera, a Czech emigre novelist, opened “The Book of Laughter and Forgetting” with a short tale about a man being airbrushed out of history by the communists, farcically carried out because they left the man's fur hat behind on the head of someone that didn't offend them. It was easier to just remove people that disagreed with the regime entirely from all public memory. Demanding an end to anyone ever displaying Confederate flags will only accomplish the opposite of what Kundera's tale did – it will take away the hat, not the man. Erasing the history of this nation is not an option, but learning from it is. Like the Holocaust, it takes staring in the face of evil, dissecting it, and repeating what it means publicly, even if that means looking into one's own past, or one's own features in the mirror that have been handed down from a monster. The same is true for racism and slavery. There is no difference between Confederate flags and swastikas here, as long as the reason why people hold onto their past under those symbols is to prevent the repetition of horrific acts. However, Gettysburg is not about racism or slavery, and hasn't been since Lincoln declared that place neutral and hallowed ground. At least that's how Pennsylvanians teach the history of that place.